MIUI fans are waiting for the MIUI 8 ROM for a long time, and Xiaomi has finally released the MIUI 8 Global Developer ROM for most of the Xiaomi phones. 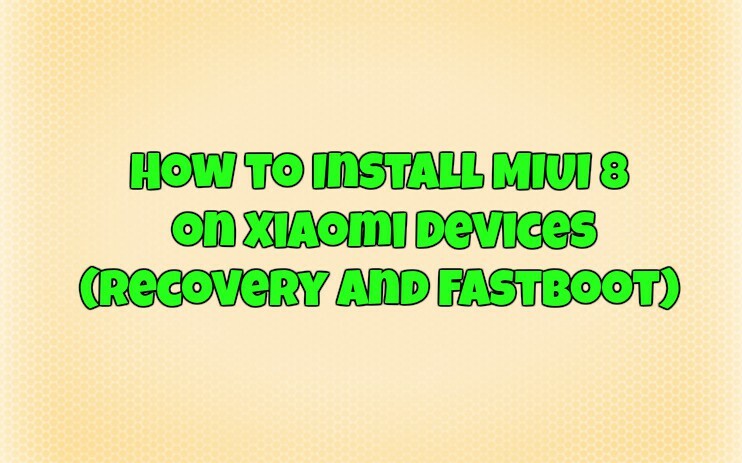 Which you can download from the MIUI forum and Install MIUI 8 on Xiaomi Devices with recovery or fastboot method. The MIUI 8 Stable ROM is expected to be released on Aug 16th and comes with lots of new features and customization which MIUI fans are waiting for a long time. Currently, the new MIUI 8 Global Developer ROM is available for most of the Xiaomi phones and here in this tutorial, we’ll show you how to install MIUI 8 on Xaiomi device with the help of Recovery and Fastboot. There are two ways to flash the MIUI 8 on xiaomi phone. First Recovery method, in which you have to flash the ZIP file on your phone with the help of recovery. Second is a fastboot method, in which you have to use the Mi Flash tool to flash the Fastboot ROM on your phone. So check below How to Install MIUI 8 ROM on Xiaomi Devices. a) Download and install MIUI 8 ROM on desktop from here. b) Make Sure that your phone has at least 50-60%. c) The bootloader of Mi 5/ Mi Max / Mi Note users should be unlocked. (Check How to Unlock Bootloader of Xiaomi Devices). Step 1. Download MIUI 8 Recovery ROM and Rename the downloaded ROM file to ‘update.zip’ on the computer. Step 2. Connect your phone to the PC and move the ‘update.zip’ file into the root directory of the internal storage of your device. (Do not put it in any folder). Step 3. Now boot your phone in recovery mode. To do this, launch the updater app on your phone and click the ‘…’ icon at the top-right corner, and select ‘Reboot to Recovery mode’ to enter. OR you can boot the phone with the help of hardware buttons. First, turn off your device and then hold both Volume+ button and Power button at the same time to enter Recovery mode. Step 4. Once your phone in recovery mode. Choose the language you use, select ‘Install update.zip to System One’ and confirm, and then your device will begin updating automatically. Step 5. Once completed. Choose ‘Reboot to System One’, and then your device should boot to the MIUI 8 version. Step 1. Download MIUI 8 Fastboot ROM (Please check if the ROM file suffix is ‘.tgz’. If it is ‘.gz’, please rename it to ‘.tgz’) And Unzip the folder on your desktop. Step 2. Now download the MIUI Flash Tool here and install the same on your Windows desktop. Step 3. Boot your Xiaomi phone in fastboot mode. To do this, Turn off the device. Press the Volume– key and the Power button at the same time to enter Fastboot mode. Step 5. Now Open the ROM folder that you unzip on the desktop in step 1 and copy its path on the computer. Step 6. Now run the MI flash tool app that you downloaded in step 2 and paste into the address bar the ROM file folder path copied in the last step. Click on the first button (circled in yellow) to Refresh, and MiFlash should automatically recognize the device. Then click the second button (circled out in red) to flash the MIUI8 ROM file to the device. Step 7. Wait until the progress bar of MI Flash tool turns green, which means the ROM has been successfully installed. Then your device should automatically boot to the new version. That’s It. Now the MIUI 8 is successfully installed on your phone. Hope you like this guide “Install MIUI 8 on Xiaomi Devices.” For any problem, leave the comments below.